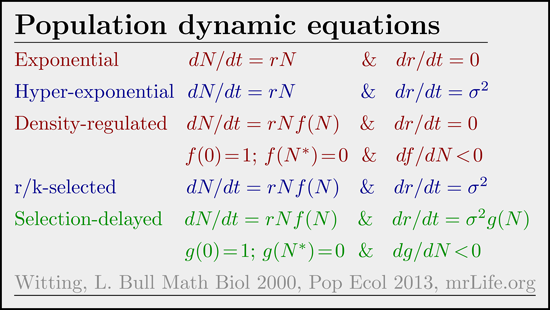 Population dynamic equations Red: Traditional equations with no selection. Blue: With r- and/or k-selection. Green: With feed-back selection by density dependent interactive competition. Because of its ability to determine the level of interference competition in the population, it is the selection of mass that determines the abundance of the population dynamic equilibrium. This makes the population dynamic equilibrium a function of natural selection (Witting, 2002), as well as a function of density regulated growth. And it is not only the equilibrium that is affected, but the population dynamics around the equilibrium is also affected by a selection-delayed feed-back. The result of this integration, of traditional density regulated growth with the feed-back selection of interactive competition, is a unification of the equations of natural selection and population dynamics. Limitation is then a function of the selected density regulation optimum (Witting, 1995) that determines the Damuth (1981, 1987) allometry, where the abundance of terrestrial animals tends to scale with a negative 3/4 exponent of mass. And the dynamics around the equilibrium is a selection-delayed cycle (Witting, 2000, 2013), that resembles the population dynamics cycles that have fascinated ecologists for decades. And should the dynamics be taken to the limit of zero density, it transforms into a hyper-exponential curve where Fisher's (1930) fundamental theorem of natural selection is replacing the Malthusian principle of geometric growth (Witting, 2000, 2002). Damuth, J. 1981. Population density and body size in mammals. Nature 290:699--700. Damuth, J. 1987. Interspecific allometry of population density in mammals and other animals: the independence of body mass and population energy-use. Biological Journal of the Linnean Society 31:193--246. Fisher, R.A. 1930. The genetical theory of natural selection. Clarendon, Oxford. Witting, L. 2000a. Interference competition set limits to the fundamental theorem of natural selection. Acta Biotheoretica 48:107--120. Witting, L. 2000b. Population cycles caused by selection by density dependent competitive interactions. Bulletin of Mathematical Biology 62:1109--1136. Witting, L. 2002a. Evolutionary dynamics of exploited populations selected by density dependent competitive interactions. Ecological Modelling 157:51--68. Witting, L. 2002b. Two contrasting interpretations of Fisher's fundamental theorem of natural selection. Comments on Theoretical Biology 7:1--10. Witting, L. 2013. Selection-delayed population dynamics in baleen whales and beyond. Population Ecology 55:377--401.